Struggling on how to get a professional web design for your church website? Despite all you’ve heard, building a website for your church can be one of the most creative and rewarding things you can do without calling in the pros. At this point, WordPress has got you covered. Quite frankly, there’s no other CMS platform that has made it very easy for newbies to create great-looking websites like a pro. For that reason, we’ve lined up a list of the best modern church WordPress themes for you to explore. The best thing is that no coding skills are needed to build a church website without jeopardizing on design and features. Since the web is changing rapidly, you need to keep your church website bang up to date. Tons of modern WordPress themes can be a huge help when building a website with less coding issues. Confused with the choice? Think carefully what differentiates you from other organizations. That way, it’ll be easier for you to focus on the unique needs of your church’s website to spread your message to a wider audience. At the end of the day, chances are your website can make a great impact on your users and help them meet your church in person. 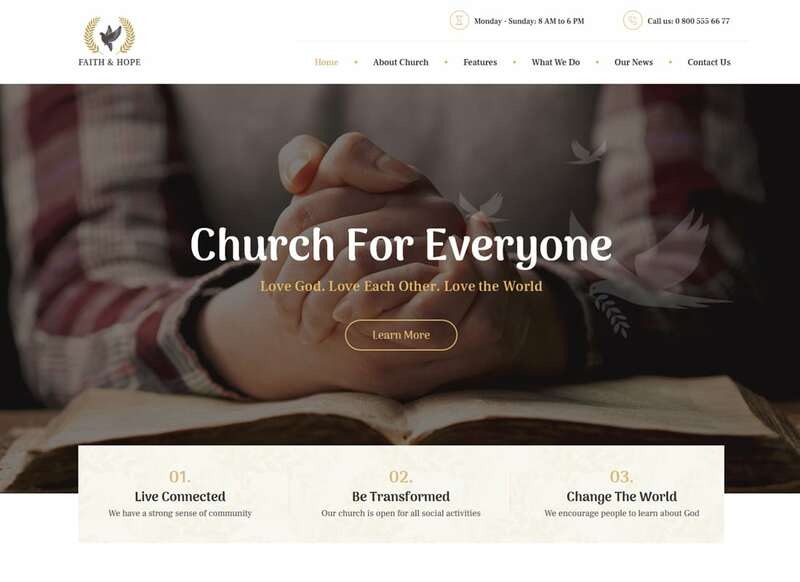 If you’re looking to get a church website that is easy to build and design, take a moment to check out modern church WordPress themes below. Most of the solutions on the list below are responsive, SEO-friendly and come with the Events Calendar functionality to help to get the attention of the visitor. 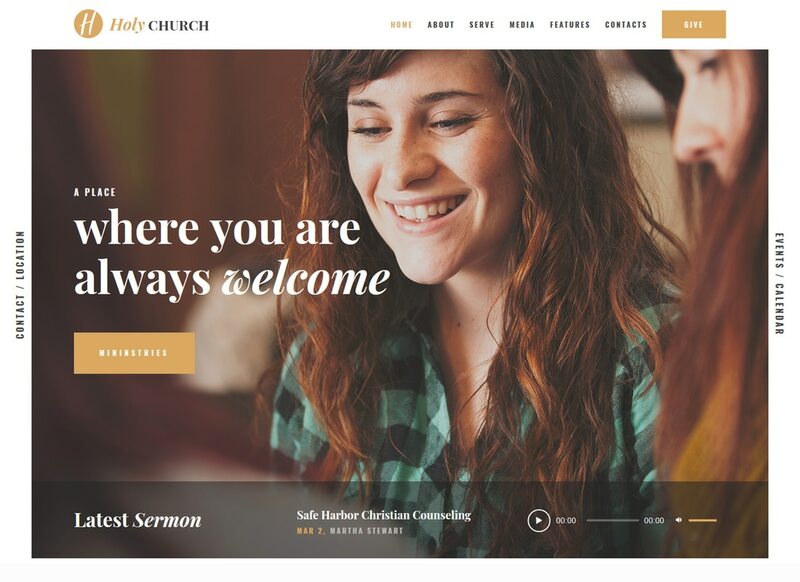 Now, these are the best modern church WordPress themes you simply can’t miss out. With only seven seconds to capture visitor’s interest, your church website’s design should be thought out and up to date. For now, go make sure you’ve picked the right solution for your church website. If you’re still confused with the overall conception of your site, go start from the beginning up. Explore the list of the modern church WordPress themes above to make a more informed decision later on. 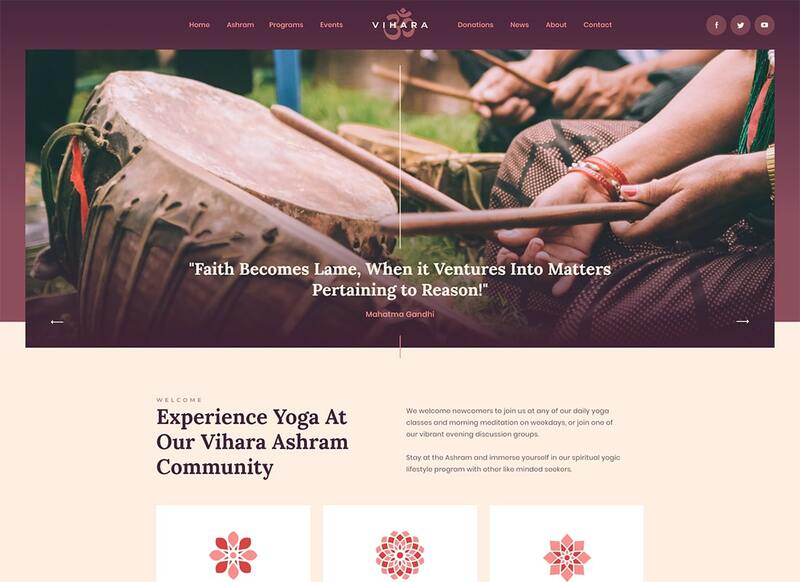 Vihara WordPress theme is ready to become a solid foundation for yoga, church, meditation, spiritual practices, cultural events, and inspirational classes websites. It’s built with WordPress 5.0. The theme is 100% responsive and fully editable. You can feel free to boost the performance of your future web page with a range of popular WordPress extensions. The theme is fully compatible with Elementor page builder, which lets you modify all pre-designed layouts in the drag-and-drop mode. Vihara includes a Powerful Give - Donations plugin, Events Calendar, Timetable and Event Schedule, and a range of other features that are essential for the launch of a Buddhist website. 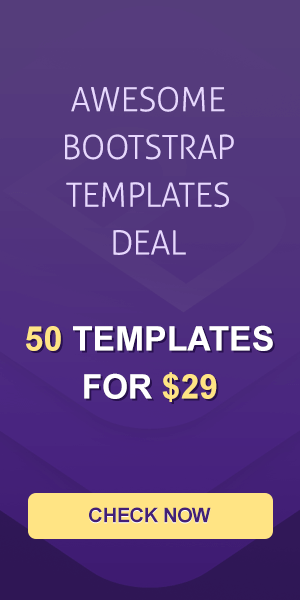 The theme is fully compatible with Slider Revolution, Contact Form 7, ThemeREX add-ons, Essential Grid, WooCommerce, and other handy solutions that will help you build a functional and usable web project that will appeal to your own community. 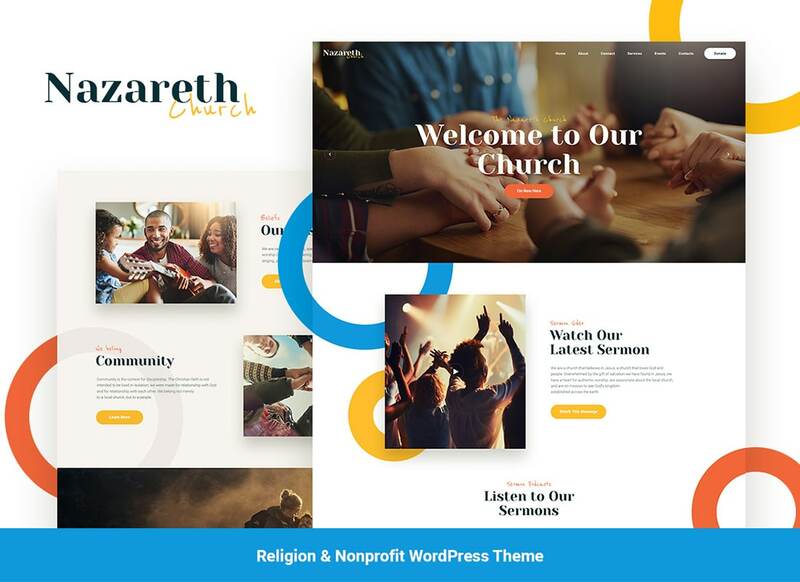 Nazareth WordPress theme is a functional and fully editable web solution that’s intended to be used for the launch of church and religious-related online projects. The theme features a fully customizable layout that can be adjusted to match any goal and web project of yours. 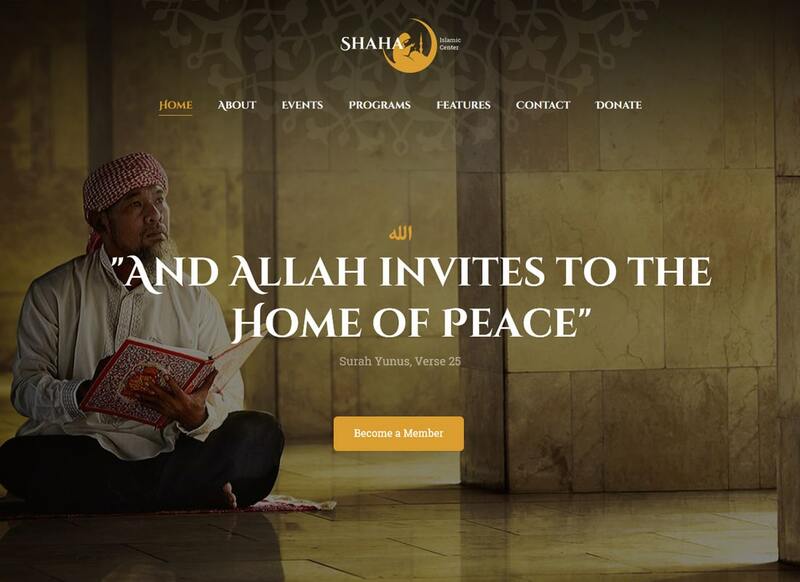 The theme’s download includes a bunch of features that are intended to be used on religious sites specifically. For example, you can enhance your web page with Give Donations functionality. The possibility to reveal a Timetable and Event Schedule are also provided. Nazareth is built with WordPress 5.0. It’s fully compatible with GDPR demands and Gutenberg page builder. Additionally, you can install a range of popular premium WordPress plugins to your site. If you want to modify this WordPress theme code-free, then you will enjoy its full compatibility with Elementor page builder. Need to build a church website? Then bring this specimen of modern WordPress themes to your notice. GDPR & Gutenberg ready, Free Church meets the latest website design practices. Thus, crafted for church and believer community, it fits non-profit organizations right off the bat. Besides, no matter how skilled you are, tons of customization options can be a huge help. Events Calendar, ThemeREX Donations & Visual Composer plugins give you all the help you need without having to sweat for it. 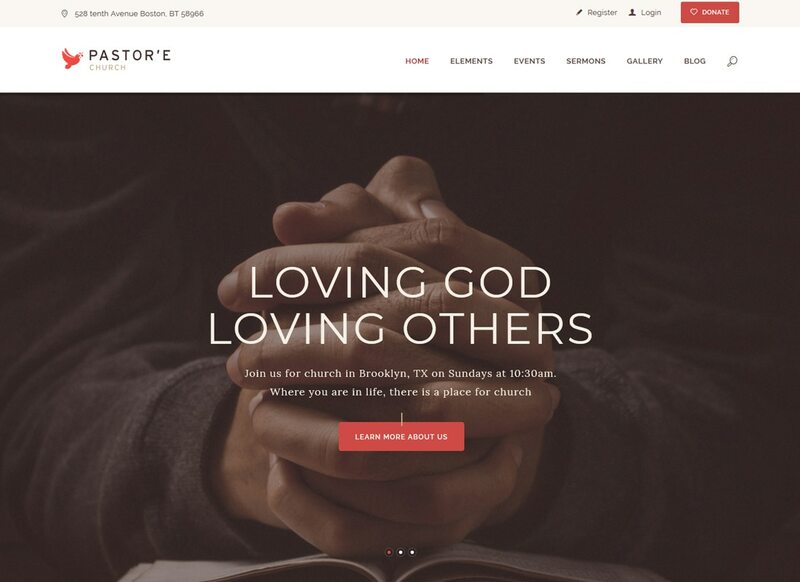 At last, WooCommerce allows you to launch a Christian literature e-store for less. Modern, responsive and attractive, Holy Church is worth your attention. At this point, it’s a perfect choice for churches, charity, volunteering, and non-profit organizations. The best thing is that it comes with the donation plugin straight off. Show important information such as bible study or fundraisers, start an e-store selling books or gifts, and much more. Its clean, simple design organizes the wealth of information in a way so as it doesn’t look at all cluttered. Poke around a set of pre-made pages, tons of eCommerce options and custom shortcodes to make a positive first impression. At the end of the day, you’ll see that promoting your church is not all that difficult. Clean, stylish, and responsive, New Life sticks out a mile. Its modern layout fits church, prayer group, charity and non-profit organizations right off. Apart from accepting donations, it's easy to start your own e-store and sell books, gifts or apparel. Take advantage of its pre-designed pages to make sure your website looks unique and personalized. Also, forget about coding issues and create extra layouts by simply dragging and dropping elements. Remember that everything you need is at your fingertips. Now, go and make something happen. 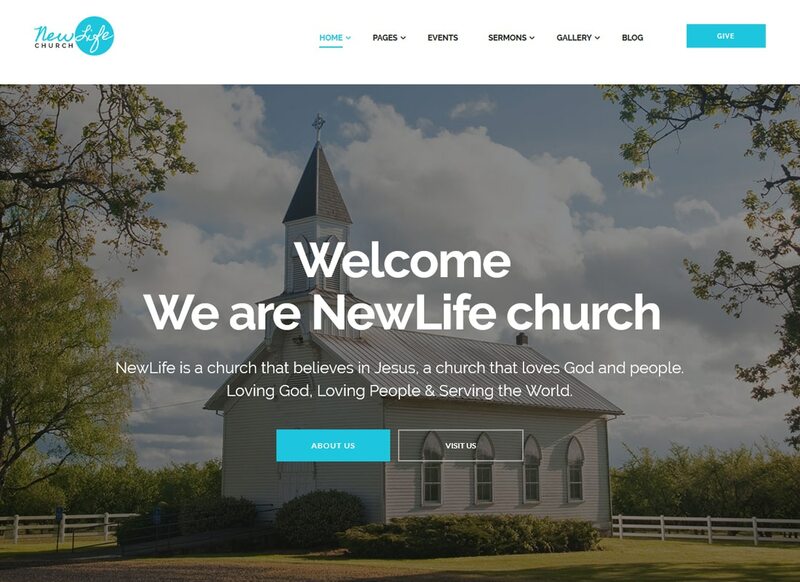 What does it take to build a church website? In fact, the right specimen of modern church WordPress themes is enough. Give Pastor'e a shot. Designed for church websites, it fits prayer group, believer community, leadership academy and non-profit organizations. Apart from a set of pre-designed pages, it comes with a single page for pastors & priests. Indeed, it has the functionality of the charity donation plugin and events management. Besides, feel the freedom to create extra layouts and turn your website into an online store selling gifts or books. So, once you go for Pastor'e, you'll never look back. The sleek and attractive design used in Faith & Hope is visually inviting. 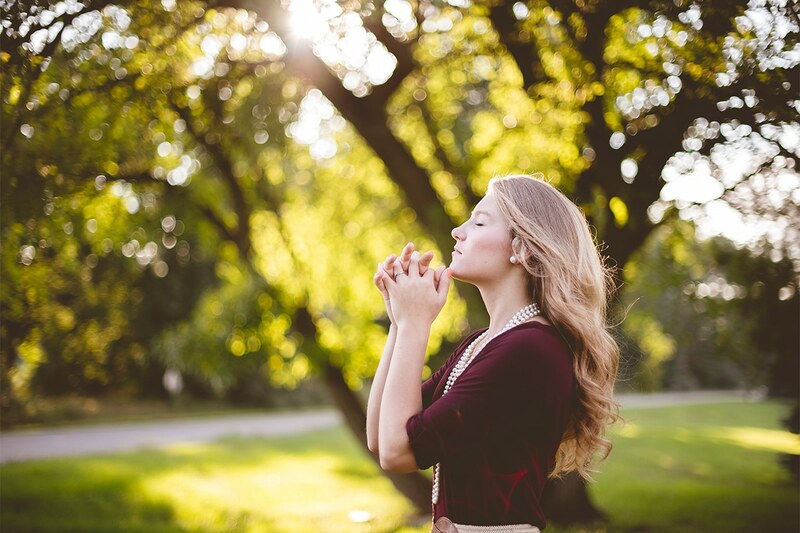 Move beyond the simple prayer request form and create an elegant and easy-to-use website that engages. Its clean and professional design is second to none on any screen resolution. Do everything in your power to help users to interact more clearly with your website. Of course, you can create and show upcoming events, start your own blog to promote your church, accept donations. WooCommerce ready from the ground up, it’s the best solution for selling online. Help your church grow and thrive with Faith & Hope. When you need to get a website for your church Grace can be your greatest ally. 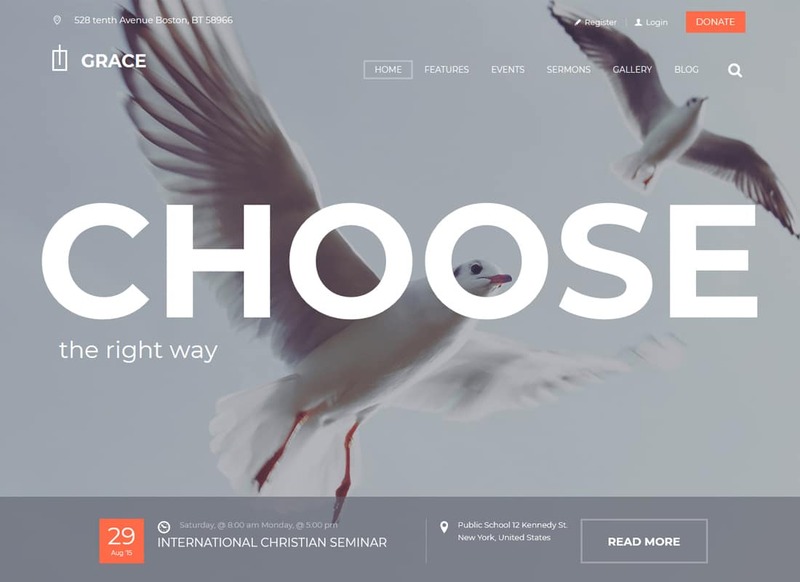 Bright, clean and eye-catching, Grace sticks from the rest modern church WordPress themes out there. First, it's SEO optimized, so it can help keep your website's search engine ranking high. Second, GDPR & Gutenberg ready, Grace can help keep your website bang up to date. Additionally, it comes with the donation functionality, events management, WooCommerce integration, and cross-browser compatibility. At last, WPML ready, Grace nearly opens your website up to a new culture. Contemporary website design is the way to go if you want to bring your church website forward. 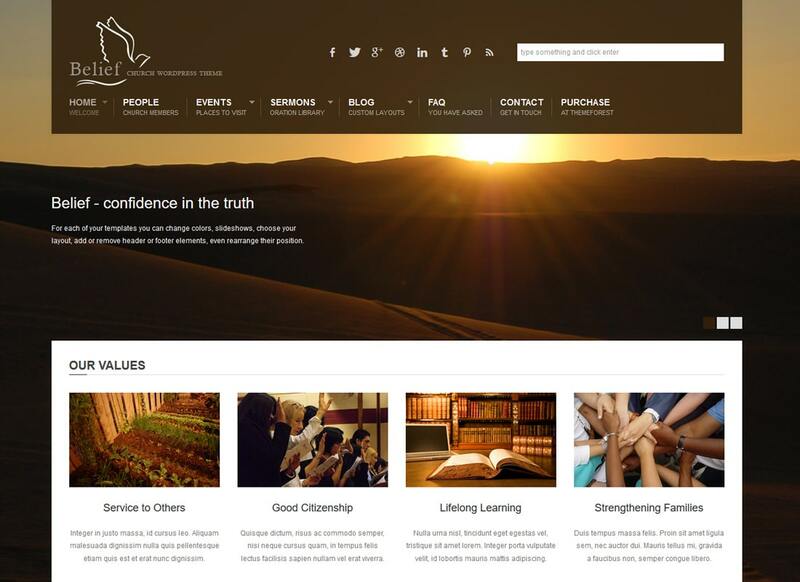 Built for Islamic websites, Alhambra is responsive from the ground up. At this point, more visitors will respond and interact with your site. Well, it comes with 4 beautiful layouts, so you can choose any of them to put a stake in the ground. Apart from WPML support, Alhambra comes with RTL options to switch your website to e.g. Arabic. Additionally, it features event management, donation functionality, Parallax effect, and cross-browser support. What would your visitors want to see? Tell all your bells & whistles with the help of awesome sliders and galleries. 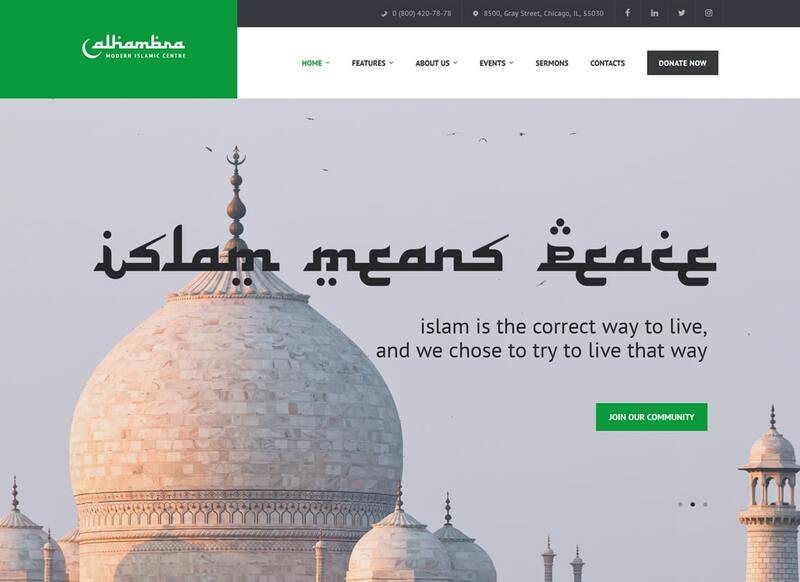 Shaha is another specimen of modern church WordPress themes designed for Islamic websites. Compatible with WordPress 5.0, it’s built in line with the current website design standards. So, your church website is responsive, SEO-friendly and cross-browser compatible from day one. To help you showcase what’s coming up in your center, the Events Calendar will come to your aid. Multilingual, Shaha comes additionally with RTL options to switch your site to Arabic. Don’t wait to build your online audience. Take the plunge right away. Bring more life to your church website with Great Lotus. 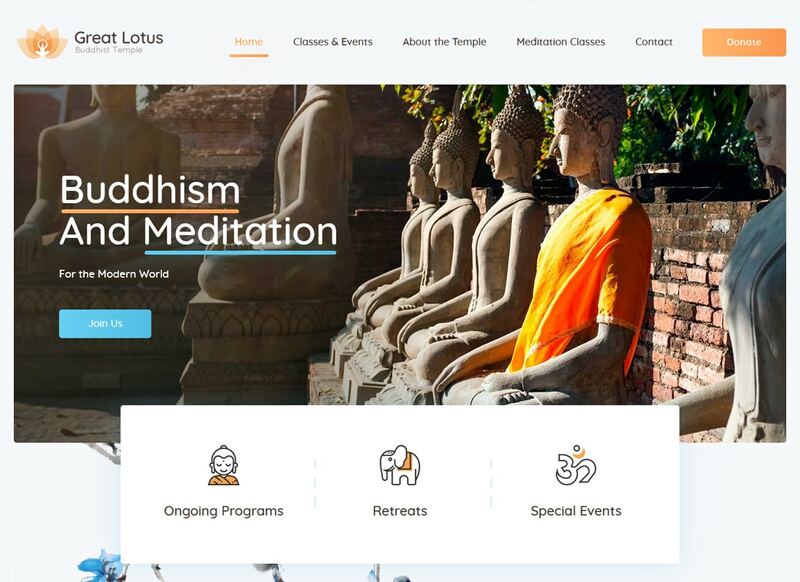 Developed to serve Buddhist websites, Great Lotus is great out of the gate. Create a splendid online presentation for your church or meditation center on a go. 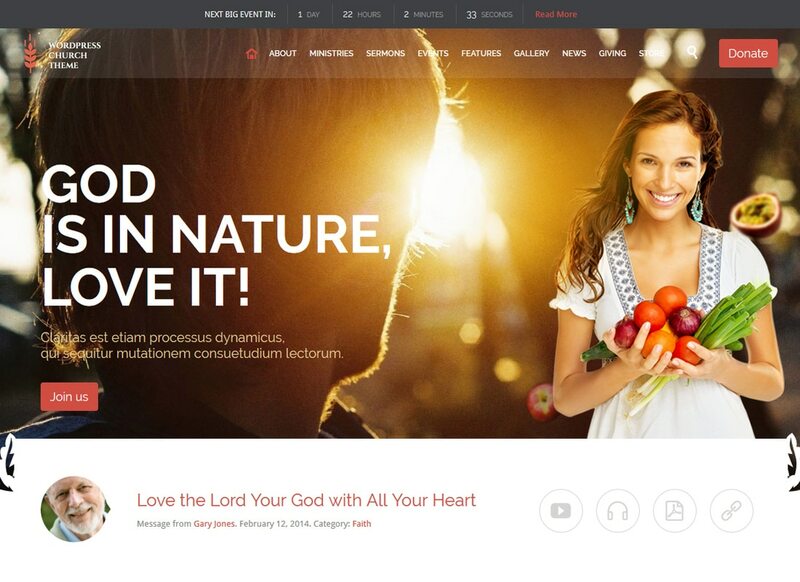 Its clean, sleek and attractive layout has an edge over other modern church WordPress themes. Thus, Great Lotus offers classes & events management, booking appointments, and donation functionality. Focus on the strengths of your church, your visitors, and your faith to make every page of your site worth the visit. At the end of the day, designed with care, your church website can help you reach your goals. One of the coolest things about Church and Events is its flexibility and ease-of-use. That said, even with a skill gap, you can easily build your own church website like a pro. No coding issues, instead, powerful drag’n’drop functionality can save you a bundle. Its clean layout is second to none to churches, charity, environmental and non-profit projects. Responsive, SEO-friendly, and feature-rich, it has everything you need at your fingertips. Besides, it features the Events Calendar Pro, WooTickets and Community Events add-ons. Without a doubt, Church and Events should be high on your list. Get inspired by Adore Church. This powerful, attractive and responsive WP template adjusts to all modern screen sizes on all devices. Indeed, its modern layout fits church, charity, non-profit and religious websites right off. It has tons of powerful features and advanced options to help you make a compelling case. Help your users book their tickets with the help of events ticket booking layout. Forget about coding issues and make your website look awesome and unique with the help of pre-designed pages. Apart from that, it features full-width Events Calendar, 12 pre-designed color schemes, and built-in Events Manager plugin. The more inside. Looking for something attractive for your future church website? Give Dunamis a shot. 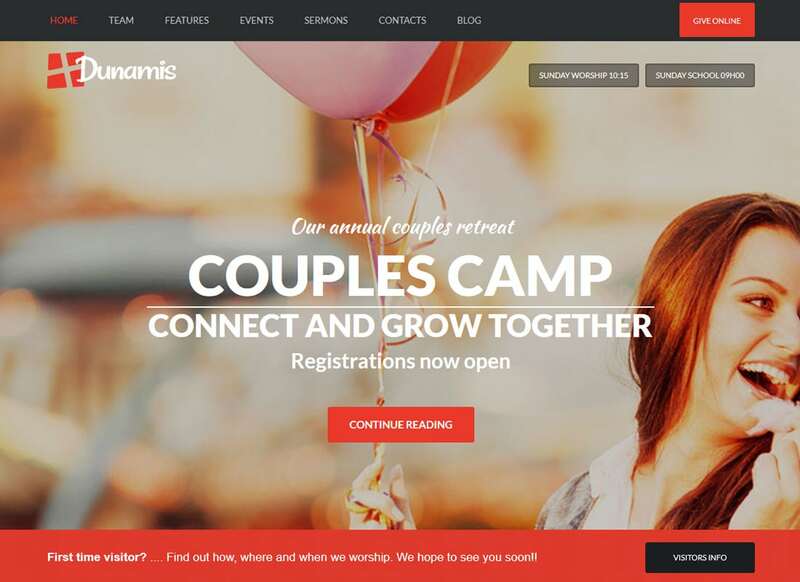 Modern, responsive and eye-catching, Dunamis fits churches websites right off. Moreover, it’s one of the best-selling modern WordPress themes out there. Your website can be the next big thing built with Dunamis. So, wait no longer and take advantage of this feature-rich solution. Besides, Dunamis comes with donation functionality, events management, and WooCommerce integration. Waste less time coding, instead enjoy a simple and seamless site-building process. Why not check out Dunamis right away? 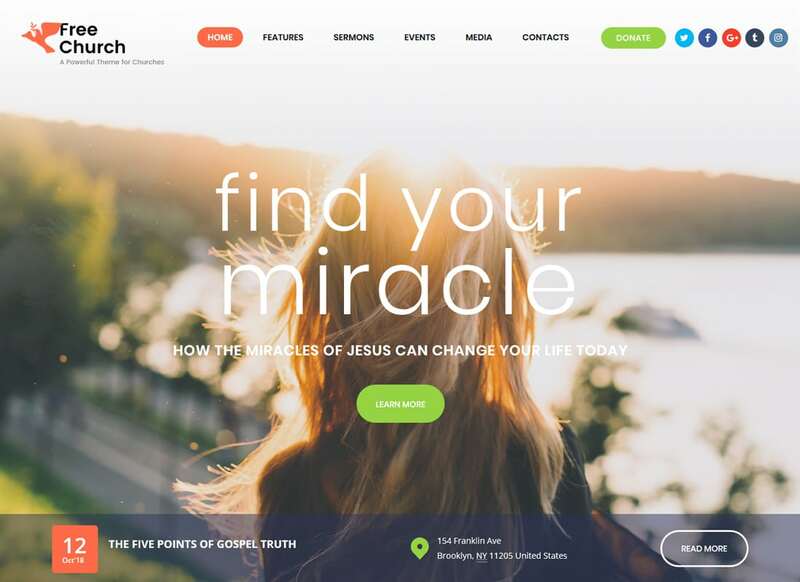 With Ichthys, your church website will look modern and attractive no matter what. First, it comes with the total donations functionality which is must-have for any church website. Second, the Events Calendar functionality makes it much easier to create and show your upcoming events. As a result, your users are engaged big times. One thing seems clear: Ichthys is worth the trouble. Go launch your online shop selling different apparel, books or gift stress-free. Make it easier for your users to find your church in person. 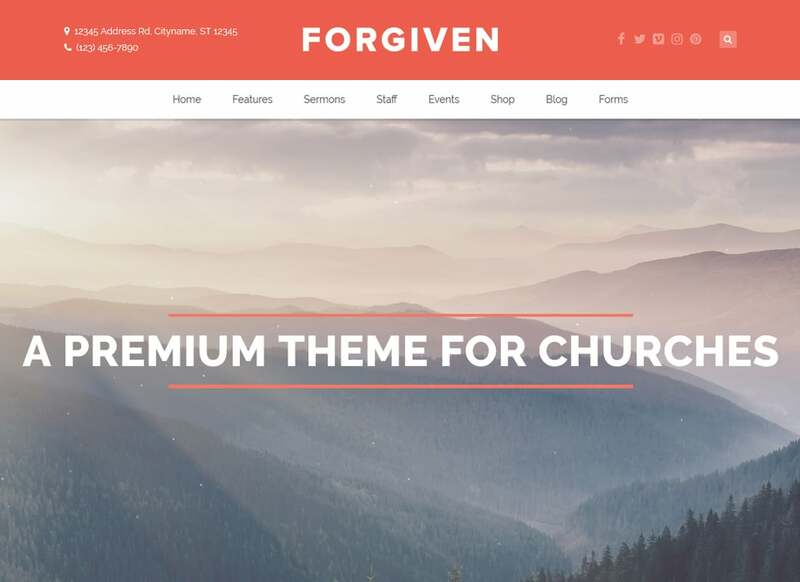 The visually striking Forgiven is another eye-catching specimen of modern church WordPress themes that will blow your visitors’ minds. 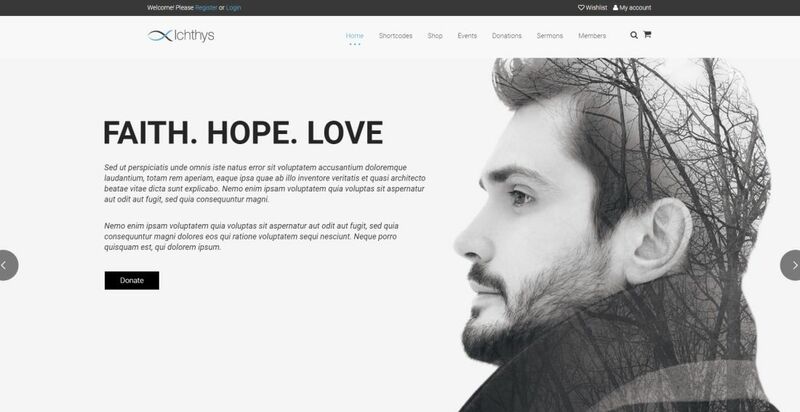 Packed with tons of features, this WP template will give your website an edge over the rest, doubt-free. Don't worry, there's no need to learn how to code. Just take advantage of the powerful drag'n'drop building with Visual Composer. Catch every user's eye with awesome sliders and galleries. Sermons, staff and events, what else could you dream of? That’s not all! There’s more to explore. Did we mention is WooCommerce ready? 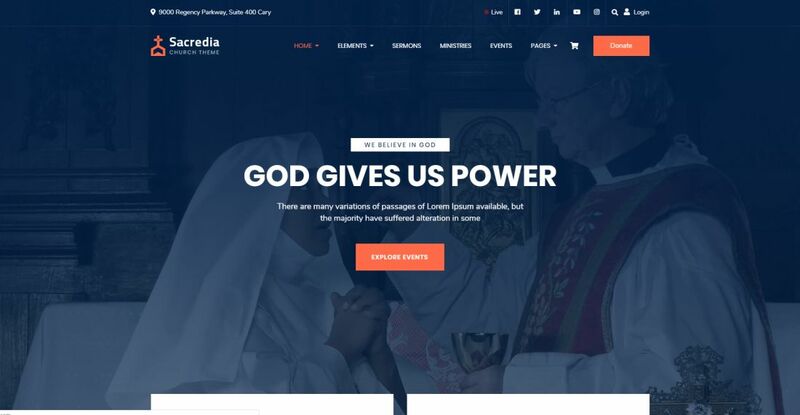 Responsive from the ground up, Sacredia is one of the best modern church WordPress themes you can't ignore. 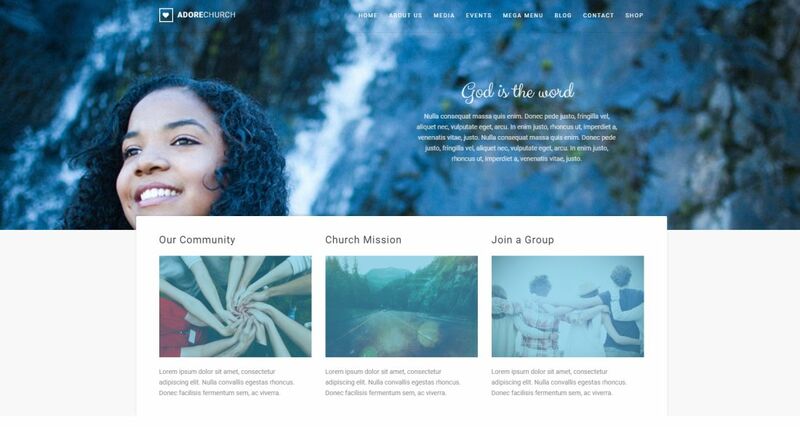 Designed with the help of an active pastor, Sacredia has everything a church website needs. Thanks to the power of WPBakery it's easy to create extra layouts to make your website more personal. One of Sacredia perks is WooCommerce integration that allows you to start selling just about anything right off. With the help of an administrative map view, you can get more insight into the location of the members, time of visit, and the like. And that's only the tip of the iceberg. Give Sacredia a go. Still confused with the right design for your church website? Incarnation can be the solution you shouldn't miss out. Modern, clean and responsive, Life Churches adjusts awesomely to all modern screen sizes on all devices. Having the options to create and show upcoming events in your church is always a good thing. Besides, you can easily turn your website into an online store selling books and apparel. 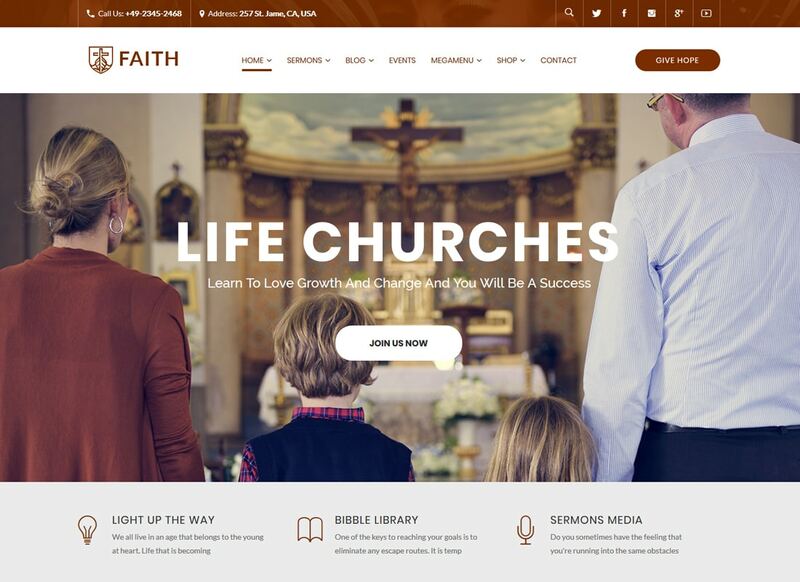 Do you want to explore this theme for your church website? Enough sitting on the fence, give Life Churches a try. 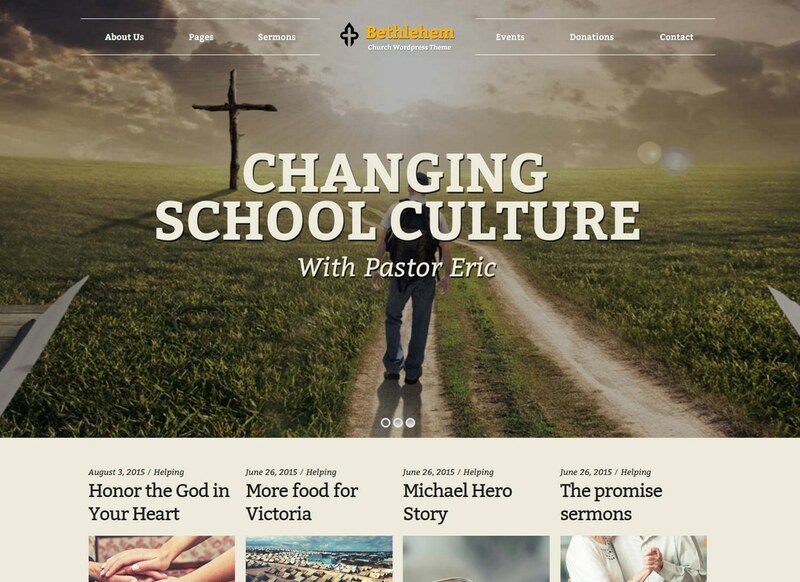 Bethlehem is another great specimen of modern church WordPress themes worth its value. Powerful, clean and responsive, it fits churches, charity, non-profit and prayer group websites. The best thing is that you can use Bethlehem for corporate websites without a hitch. Compatible with premium plugins, Bethlehem offers you to spice up your website to the next level. So, apart from a set of beautiful demos, it features different header styles to choose from. Indeed, Events Manager and WooCommerce integration are the creams of the crop. Wondering if Bethlehem is the right one for your church? Go and check it out. Packed with user-friendly features, Belief is ideal for those with a skill gap. Powerful, easy to use and customize, Belief fits non-profit organizations, religious communities, and churches. so, depending on what you need, it's easy to display any content type you wish on any page without having to touch a single line of code. The best way to get users to know you is to start your own blog. Want to give your website a bit of interactivity? Great, enable the 'like' feature o let users rate your posts. Go, enjoy its live demo before the purchase. Explore Real Church to see if it fits the vision for your church’s website. Clean, modern and attractive, it fits everything that church WP template must have. It's so versatile and easy-to-customize, so you can't simply go wrong with Real Church. Besides, its SEO-friendly code allows keeping your search engine ranking high. In addition, sermon post type supports video, audio, and attachments. Manage your events like a pro, stress-free. Aren’t these features worth exploring? 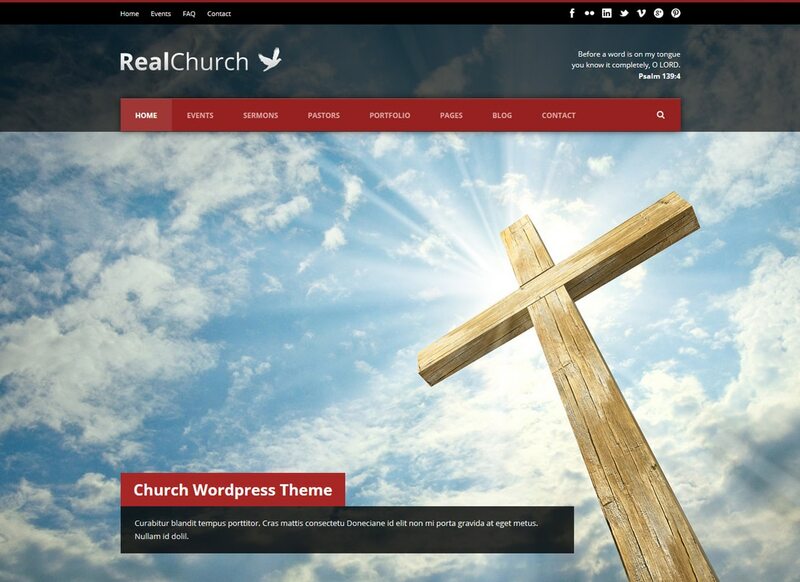 That’s no wonder that Real Church is one of the best modern church WordPress themes out there.